Mary, her sister, took a different approach. She listened with her whole being. recorded first in the Gospel of Luke. The man in the story is Jesus. he has a few words to say to Martha. with all her scurrying about. She’s both distracted and distracting. 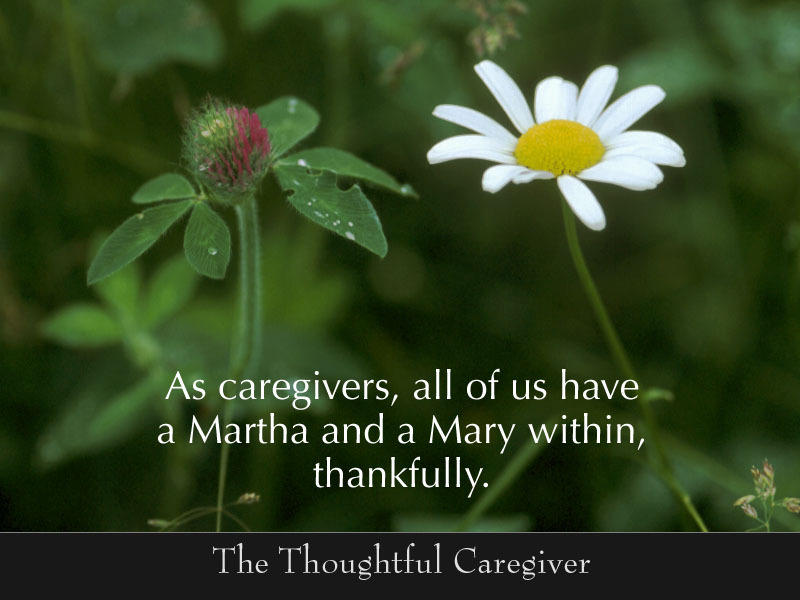 Technically, this is not a caregiver story. related to the man in their midst. about all the work she “had” to do. and became both present and attuned. One displayed a kind of caring. The other breathed a kind of caring. Why do I retell this story today? and start swinging those arms. in making sure we’re seen in this way. can help bring our point home. We’re sitting, taking in, communing. so it begins to fill the space we’re in. our purposeful and committed Mary. and are grateful for it. 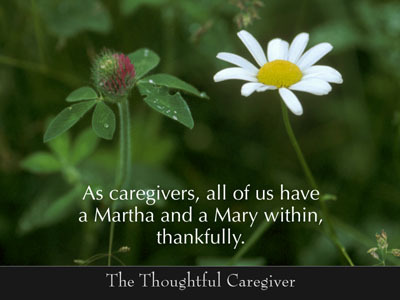 This entry was posted on November 30, 2007 at 8:14 am and is filed under Caregiver Truths, Caregiving & Spirituality. You can follow any responses to this entry through the RSS 2.0 feed. You can leave a response, or trackback from your own site.